I was hoping for a bit more color out of the sky this morning, but in the end I got a cool, quiet, and dark sunrise. Last night’s sunset was really pretty with lots of color and a sprinkling of light whispy cloud cover. It looks like our streak of pure clear skies is being challenged by a change in weather. The forecast for today still puts us at mostly clear skies, so I’m curious what the rest of the week will bring. 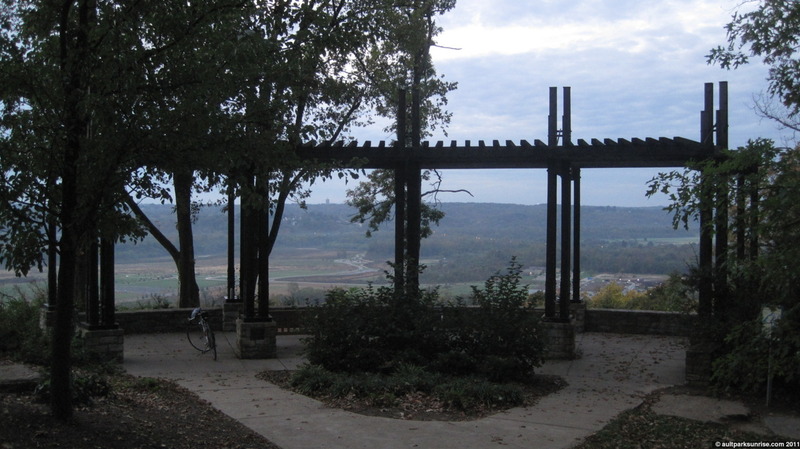 Even though it was darker than ideal in the park, I took the chance to document the pretty Ash trees that line the road by Heekin Overlook. I waited a few days too long and they’re mostly done shedding their leaves, but I realized that at a minimum I needed to get a picture of them because it is possible that they only have a few years of health left in them. I covered the Emerald Ash Borer Beetle a bit in sunrise 102. It’s amazing how quickly the autumn colors are marching in. Summer is behind us now. With all the rain we got this year I imagine the forest will be among the most colorful in recent years. 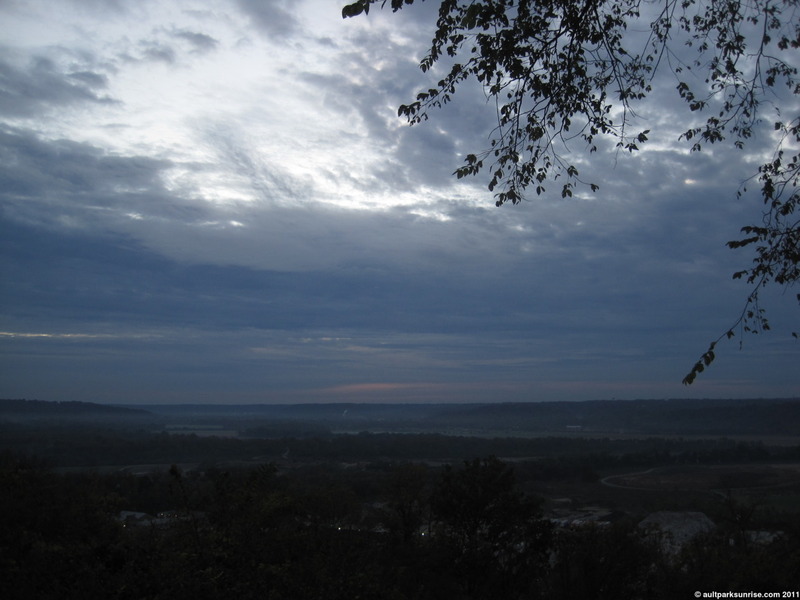 The dark morning @ Heekin Overlook. Behind me, to the west, there were open skies and shades of light pink and yellow. Out to the east, towards the sunrise, there was a low lying bank of thick cloud that blocked almost all of the morning light. That’s OK though, it was a great morning to watch the squirrels scurry about trying to collect all the falling acorns. A bit of a dark picture, but these are the Ash trees that line the road. They are among the first trees to completely shed their leaves. I hope this is a species specific trait, but I fear that this is due to their probable Ash Borer Beetle infection. It could also be a side effect of the treatment that the park service has them on to prolong their inevitably doomed life :(. It is my understanding that there is nothing you can do to save these guys. It appears the park service hasn’t given up yet, though, because so far there are no new young trees planted along side these aging ashes. 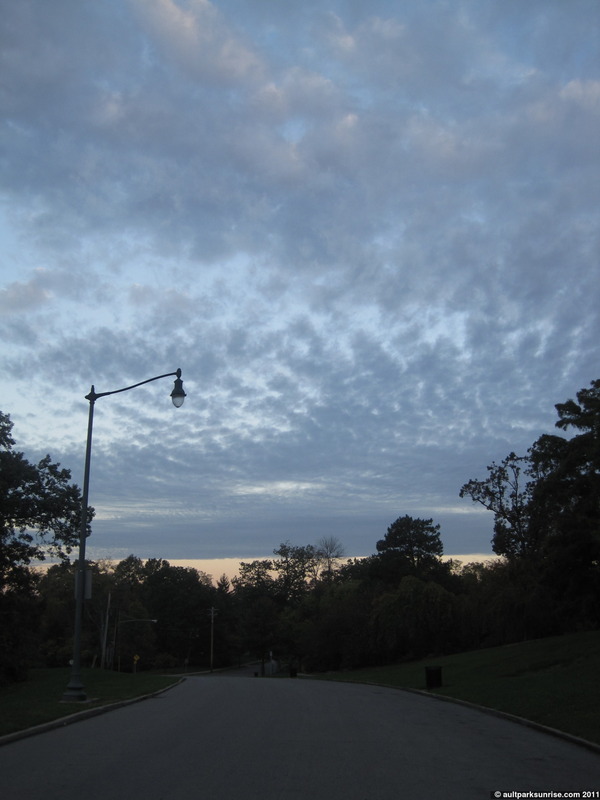 Heading out of the park, I notice that the western sky has several patterns and colors. I think the rule of thumb is that if you want to see what the sunrise colors were 15 minutes ago, look at the western sky. The opposite is true with the sunset: If you want to see what the sunset will look like in 15 minutes, check the eastern sky. On the way home I found a young Ash tree that still has its full set of leaves. We can see the color is a burnt red that fades into a light yellow. I can see why the tree is called ‘ash’. 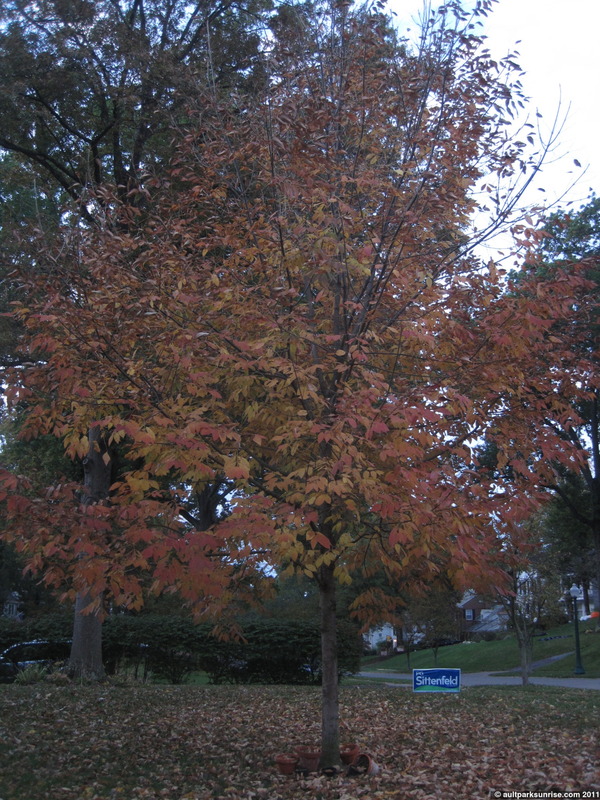 As the colors fade into the mostly yellow shade, the leaves begin to droop. They do sort of look like they’re barely hanging on, like whisps of newspaper rising in a heat column above a bonfire. 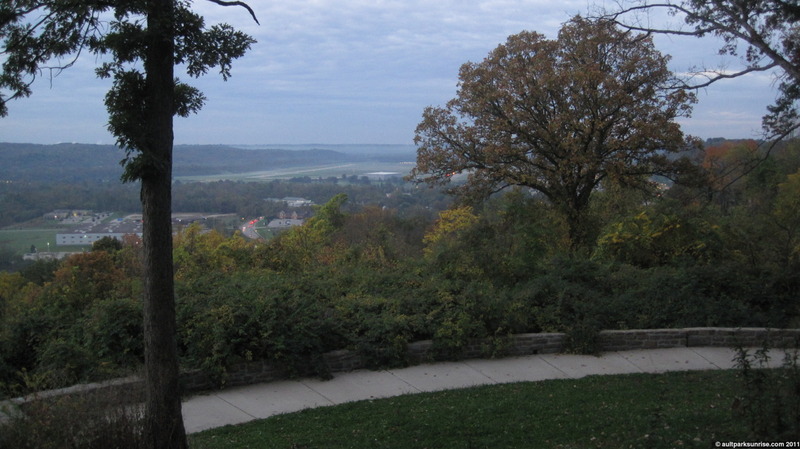 This entry was posted on October 11, 2011 by Ault Park Sunrise. 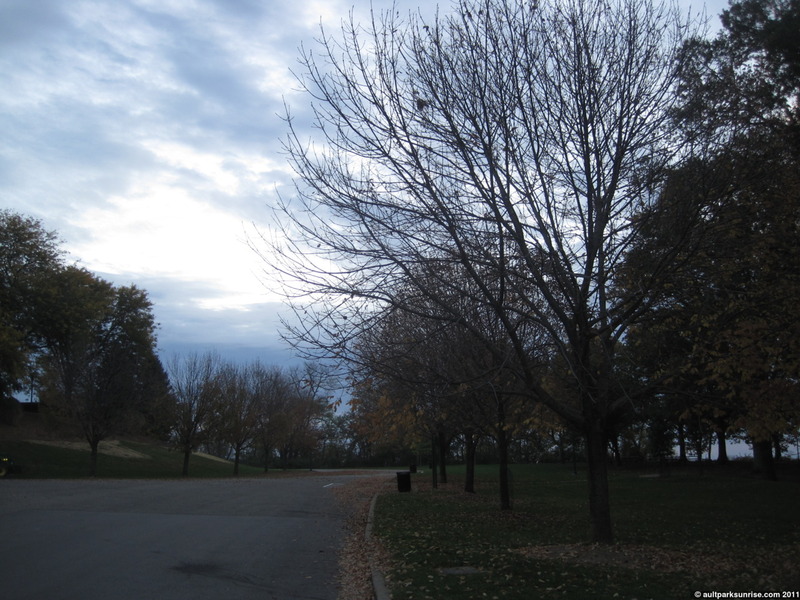 It was filed under ault park, focus: trees, slightly cloudy and was tagged with ash tree, ault park, cincinnati.